Serenity’s soul-reading ability lets her easily create custom tattoos. Everything else in her life is a struggle, from trying to make it work with her best friend, Evan, to nightmares and visions that make her question her sanity. Then she meets a man who sharpens her craving for something more. Cyrus has been preparing to claim her as his Blessed mate—the other half of a split soul that, once reunited, is his only chance to break the curse that plagues his people. One moment, armed militants are firing questions Serenity cannot answer. The next, she is safe in Cyrus’s arms…and learning she isn’t even human. She is Kindred, blessed with preternatural powers, cursed to suffer the twin horrors of the blood rage and the dark veil. Their union is the greatest hope for redemption in a thousand years, but not all Kindred want to be saved. A dark secret could snuff out their lives before love has a chance to unite them…and redeem the Kindred for all time. Greater the love…sweeter the pleasure…higher the price that must be paid. 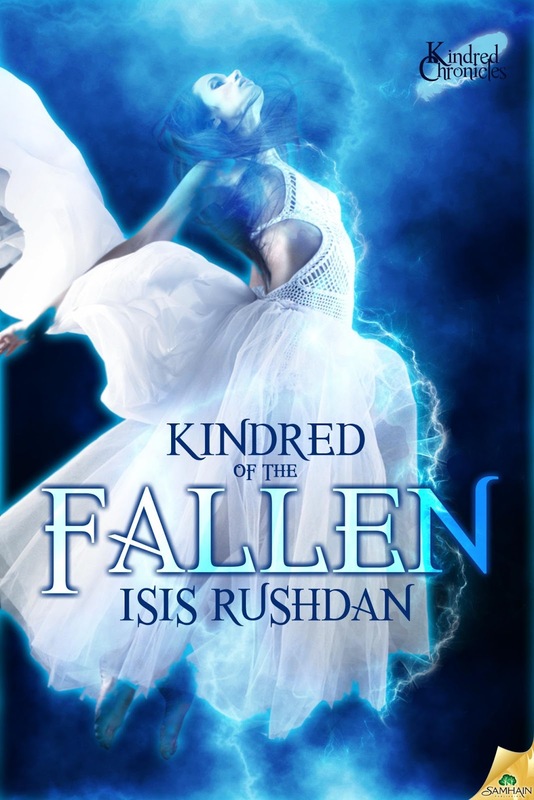 Isis Rushdan was born and raised in New York City. She has a B.A. in psychology from The Ohio State University. Wanderlust has taken her across the globe and has kept her moving every three years. Fortunately, she is blessed with a husband who shares her passion for travel, movies and fantastic food. Prior to following her bliss as a writer, she had a bright career as an intelligence officer in the U.S. Air Force. She currently resides in sunny Florida, where she hopes to finally establish roots, with her husband, son and canine kiddies. The interminable tick tock, tick tock punctured her thoughts. She rubbed her forehead, massaging in deep circles. Little good it did against the headache hammering her brain. Too bad the windows didn’t open, she’d kill for a breeze. Or an oxygen mask. Why wasn’t the a/c pumping out more air? It might be September, but she was burning up. A tingle danced over her body, raising the hairs on her arms. A gust of heat slammed into her, surged through her skin, beyond her flesh, rousing the quintessence of her being. Energy swirled in her torso, electric embers stirred ablaze. An underlying current that had grown more vibrant since the dreams now bustled with vigor. A loud rap at the door startled her and she jumped. In the doorway stood a sinfully handsome man with lush dark hair. A dazzling smile swept across the most stunning face she’d ever seen. Not pretty-boy model perfect, but so savagely beautiful she salivated. Customers didn’t come behind the desk or invade her personal space. Not in her territory, where all the power resided quite literally in her hands. She wanted to move back or shoo him to a chair five feet away, but she could only gulp, feet welded to the floor. He extended his hand, but her first and only chance to peek into his soul couldn’t be squandered on a premature handshake. Even though instinct prodded her to touch him. Looking down at her, he lowered his hand. Something playful or mischievous tugged at the naughty curve of his mouth. “Sorry.” He didn’t sound the least bit apologetic. He stepped closer, his insanely masculine, incredibly sexual body bearing down on her. He even smelled divine. Spicy wilderness with sweet hints of cardamom and sandalwood. Raw recognition poked at her memory as if she knew him, but she’d never seen him before. This was certainly the type of man one didn’t forget. Rivulets of sublime energy emanated from him. In all her days, every person she’d come across had lacked this distinctive quality. His body purred with a charged current, foreign yet familiar, comforting and unnerving her at the same time. “Certainly.” He brushed around her and sat in her chair. He lounged back in the seat, getting more comfortable, sensuous smile deepening. Alluring blue eyes, dark and exotic, locked on hers. “Where would you like me?” he asked in a liquid velvet voice that poured over her thick as warm butterscotch. A hot flush set her face on fire. Evan. I’m getting married to Evan. She repeated the words in her mind like a prayer to protect her from this complete stranger. When she swallowed, she realized her mouth had been hanging open. How long had she been gaping at him? He gazed at her with such intensity another sweet flush of heat fluttered over her entire body. She needed to do this consultation and get him the hell out of her office. His fingertips skimmed hers, his warm hand sliding toward her arm until they were palm to palm. A delicious tingle licked up her spine as his long, thick fingers curled around her, his thumb kissing the inside of her wrist where her pulse throbbed. An image blasted in her mind, bright, scorching: him holding her, lips pressed against hers, drawing her close in an embrace. She yanked her hand away. Not a damn thing she could mention. 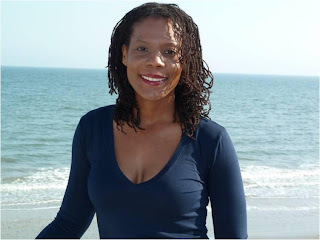 Thank you for hosting me on Book Liaison! What a beautiful cover, this book is definitely on my wishlist. Thanks for the great giveaway.